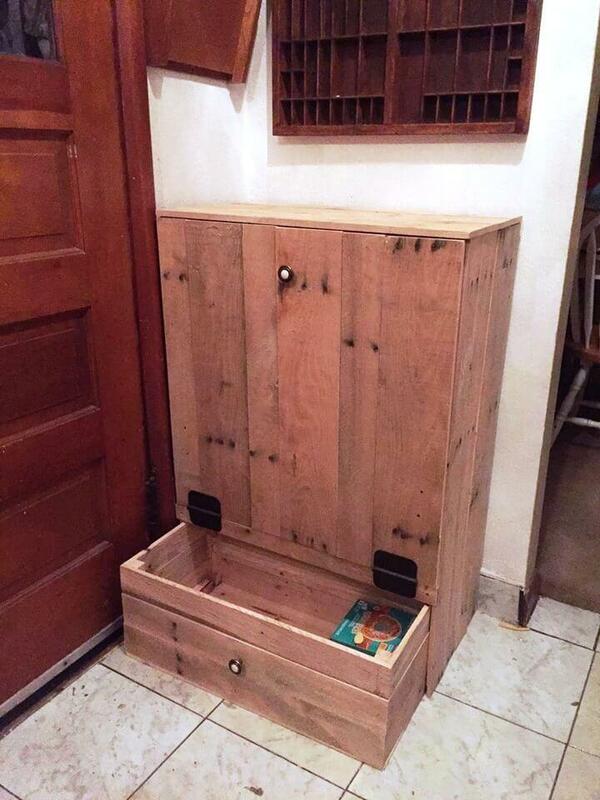 If you are also trying your best to store the interior garbage of home then you should definitely get these wooden pallet-made bins which are as functional and cost-effective as you want! 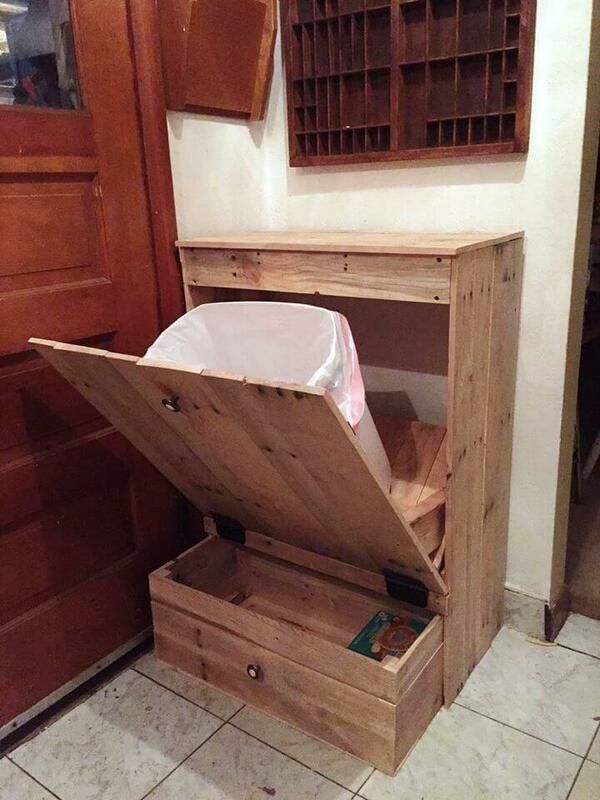 This DIY tip out pallet trash can holder is really going to help all the homey persons who want a safe and stylish solution to remove the home trash! There is a drawer built in the bottom side that can be utilized to secure your items of interest! 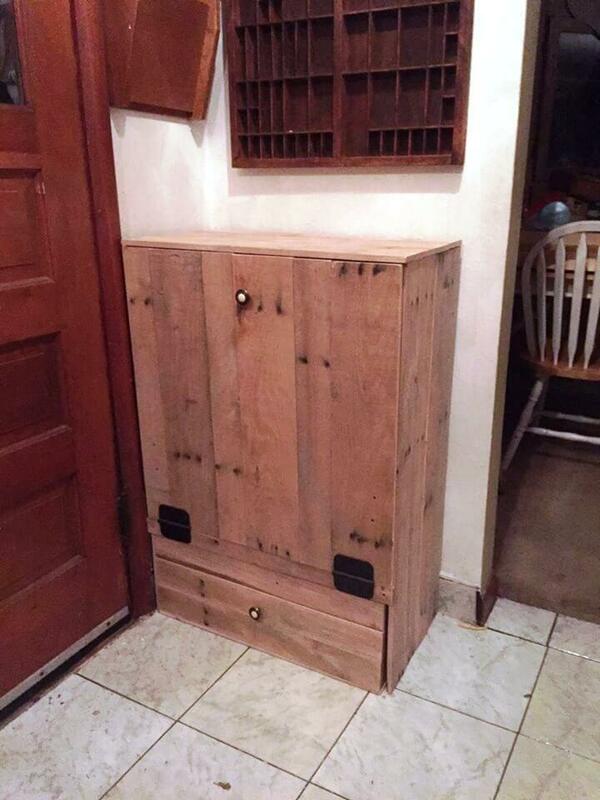 Building this wooden pallet trash can holder is really a fun, prepare a box by tight integration of pallet slats and then add the folding out door in front of the box or bin that has an attached flat wooden surface that stays inside the bin! This inside surface should be movable and you can install a hardware system for smoother sliding in and out phenomenon! This inside sliding surface attached to folding out front door, will hold the plastic trash and will keep on hiding it until you pull the door out to trash new useless objects! Really amazing! Drawer built in the bottom can be intended to store a lot of useful stuff and even the items of out of trash which are recyclable! Here folding out door comes with an accent metal knob and has been installed to position using hardware hinges, really heavy in duty! If you are not happy with the blank wooden appearance then you can simple prefer paint to get it colorful according to your own desire!